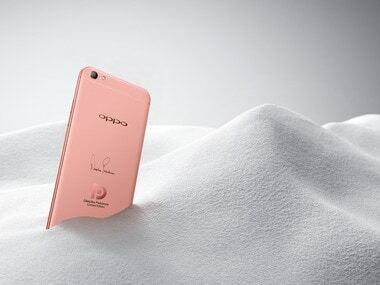 Chinese smartphone manufacturer Oppo is set to launch the successor of Oppo F3. The company is expected to name the device as Oppo F5. Chinese smartphone manufacturer Oppo is set to launch the successor of Oppo F3. The company is expected to name the device as Oppo F5. The pictures of the upcoming smartphone were spotted in Philippines. OPPO F3 Deepika Limited Edition. According to a report by Noypigeeks, the Oppo F5 the device will come with a fingerprint sensor on the back side of the phone. The company has also changed the shape of the fingerprint sensor to the oval shape on the smartphone. The smartphone is expected to come with a 6-inch FHD display panel with a resolution of 2880 x 1440 pixels. Black and red coloured variants of the smartphone were seen on the advertisement posters in a mall in the Philippines. The posters use the Oppo slogan 'Selfie Expert' suggesting that the company might bring dual camera setup on the front of the device for selfies. The website also reported about the unboxing video by Julia Barreto, a Philippine celebrity. Oppo recently launched the Diwali Limited Edition of Oppo F3 in India. The device is available for order on online outlets including Amazon. The red colour limited edition Oppo F3 is priced at Rs 18,990. Oppo F3 features 5.5-inch Full-HD display with 13 MP rear camera and dual front camera of 16 MP and 8 MP. The smartphone comes with 4 GB RAM and 64 GB of internal storage. The device runs on 3,200 mAh battery and comes with dual-SIM card slots with 4G support.